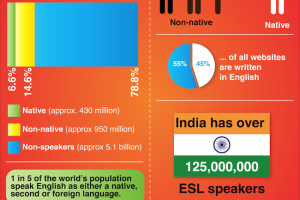 English is the main language on the web but there are twice as many non-native speakers in the world as native English speakers. If you are communicating in English to an audience beyond the borders of your own country you’ll need to think twice about what sort of English to use. And it is not just the choice of words; it is the cultural references that you’ll need to pay particular attention to. There is a great variety in the English spoken and understood by first-language English speakers. If you write like an American with references to “out of left field” and “Band-Aid solutions” you might get your idea across, as long as your readers are regular viewers of US sitcoms. But use terms such as “sophomore” and you will probably start to lose a lot of your audience who will not really get what you are talking about. Similarly, Brits need to understand that English does not belong to them any more, and that a country producing a small percentage of the world’s English speakers can no longer expect others to refer to the UK version of the Oxford English Dictionary to check what is “right”. Across Europe thousands of meetings take place every day in English with no native speakers present. The French, German, Poles and Spaniards communicate successfully and may even use words that no one born and bred and educated in the UK or North America would fully comprehend. In fact many successful meetings or conference calls of this kind work perfectly well until an English native speaker joins the discussion. The obligation is then to speak English-English rather then Euro-English and the whole equilibrium of the discussion shifts. So you need to really take your time and reflect when you are trying to get your message across to an international audience on the web, or elsewhere. If you are trying to do it in 140 characters it can be even more of challenge. Use the version of English that you use on a day-to-day basis and a significant part of your audience may not fully understand. What examples do you have of localised-English (or should I say localized?) not working when you have been communicating internationally?